We're being blessed with snow. 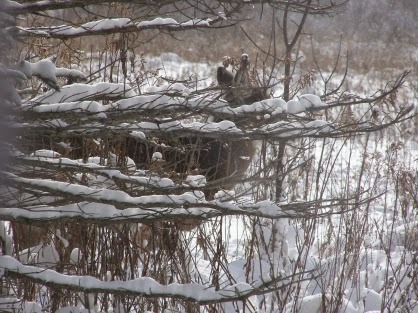 And guess who's hiding in plain site? 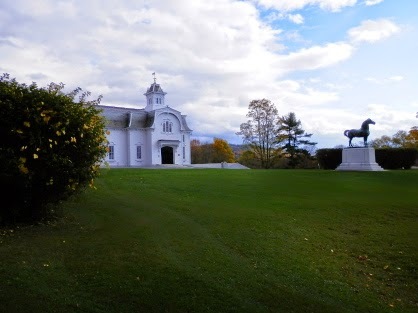 Back in October, while visiting Vermont on quilting business, I had a chance to visit the University of Vermont Morgan Farm. Oh. My. Gosh. 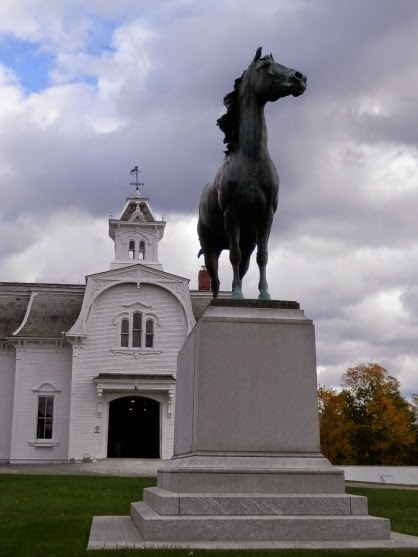 In front of the barn stands a statue of Justin Morgan, the original Morgan horse. The weather was warm, but there were dark cloud formations most of the day. Great for those dramatic pictures! 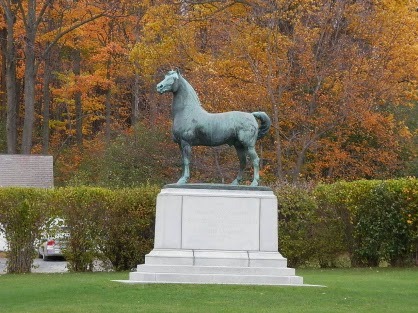 And foliage was just beyond peak, again showcasing the statue. Just an incredible place. 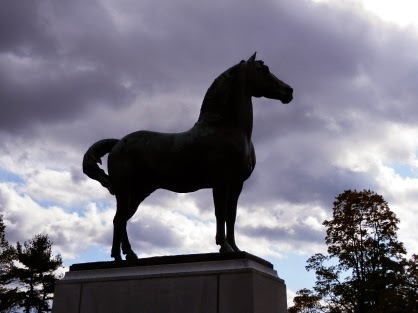 I walked up to the Remount barn where the weanlings are housed, saw the filly being raffled to raise funds for the farm, saw the yearlings in another barn, and just reveled in all things Morgan. This is the abbreviated tour of the Morgan Farm; I know some of you are champing at the bit (no pun intended) for more quilt stuff. Soon, I promise. P.S. I am listening to Festive in Death by J.D. Robb. A few weeks ago, my cousin visited from Georgia and we decided to take a tour of the 1890 House in Cortland, New York. 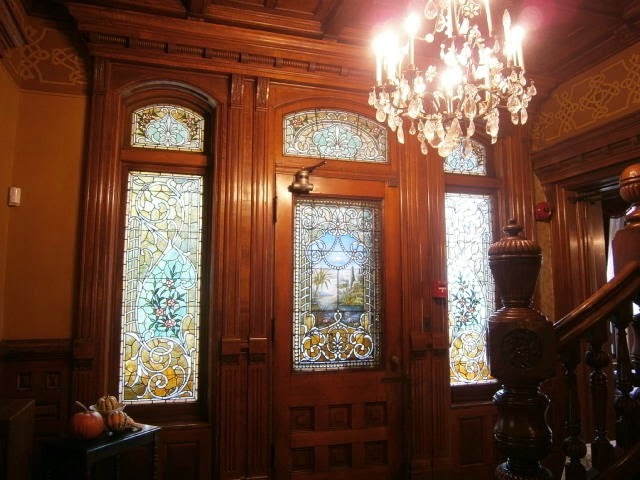 I had been once several years ago, and now even more rooms are open to the public. Here's a view of the front of the house. It was build by the Wickwire family in...wait for it...1890! Mr. Wickwire was the inventor of wire screening! Thank you, Mr. Wickwire! In the basement there is a timeline and display of some of the items manufactured at the Wickwire factory. Pictures really cannot do justice to this beautiful place. If you are in the Cortland area, be sure to stop by. You can also find out more by visiting www.the1890house.org. This is the main entrance. The woodwork in the house is just incredible. On the right in the pic is the banister to the second floor. To the right of that, not shown, is an actual inglenook with a fireplace and cozy seating. Here's a detail of the center panel of the door. And this shows a table setting in the dining room. The centerpiece is actually several pieces of crystal glassware stacked to create height, with small gourds displayed around the widest part. And check out those candlestick holders! 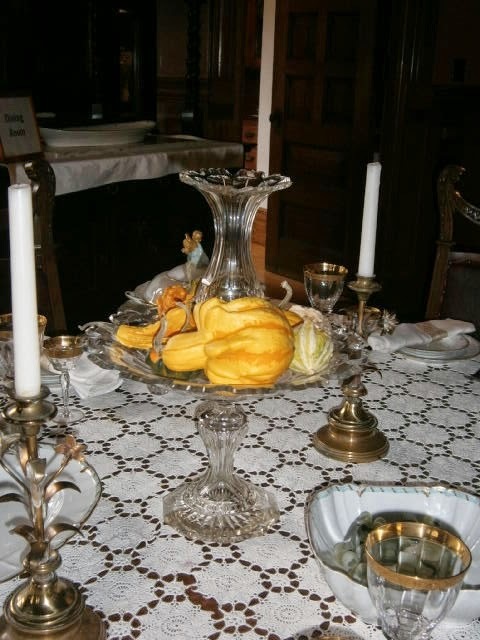 The 1890 House will soon be decorated for the holidays--something not to miss. 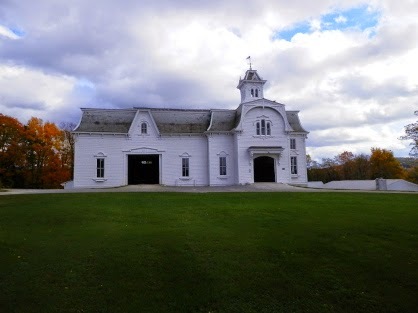 Listed on the National Historic Register, repairs are costly, and money is raised through fundraisers, donations and entrance fees to the House. The entrance fees are very reasonable, so don't hesitate to go. It truly is a step back into elegance and grandeur. Karen H. has been very busy over the past few months. 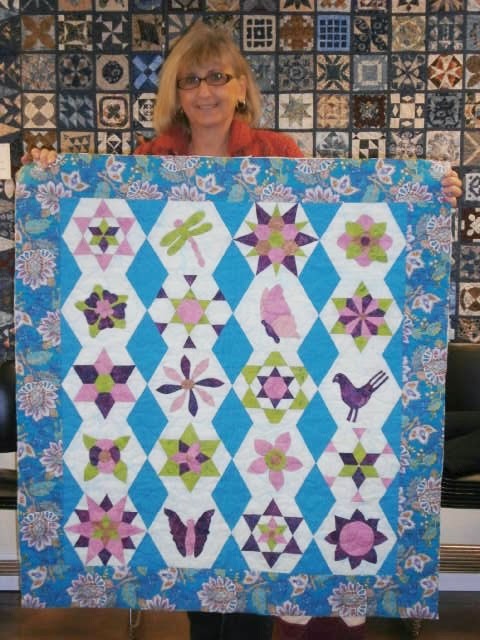 Not only did she complete the entire Bliss Doubled project (second pic) but another version using only the pieced blocks! Bliss Doubled combines both hand piecing and hand applique. Don't you love the spark of color against the black background? This is finished except hand sewing the binding. What a difference! Karen is also adding some crystals to enhance the applique blocks. Great job, Karen! Thanks for sharing! Western New York is sharing a bit of their snow wealth with us. About two inches of snow has fallen since 6:00. And the forecast is for 60 degrees on Monday! So the motto is to dress in layers, stock the car with extra blankets and emergency supplies, leave extra early for work or school so that you can be more Zen about travel delays (caused by others, of course). P.S. I'm blogging from my Kindle, so no pics tonight. Blame it on an uncooperative laptop. 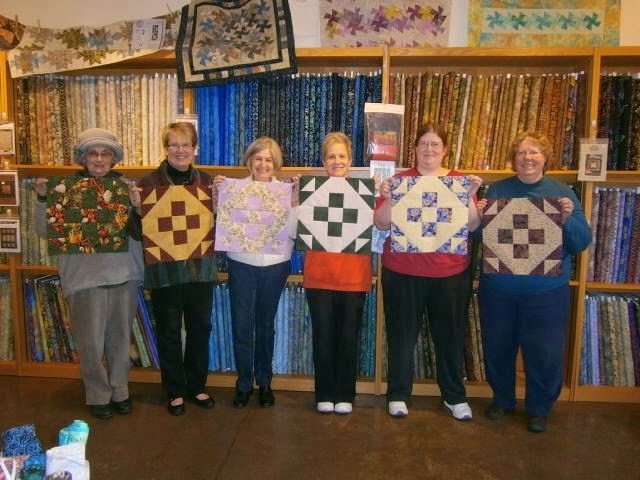 Last Saturday, six delightful women and I spent the day making Mrs. Keller's Nine Patch blocks at Patchwork Plus in Marcellus, NY. One of the blocks from my Skill Builder series, this block taught students to rotary cut, machine piece and press to perfection. We cut actual size pieces and sew them together. No cutting larger and cutting down later. No flying geese made from squares and rectangles; we cut half- and quarter-square triangles (no, there are no flying geese units in this block; I'm using it as an example of the skills these ladies are learning in the series). From left to right: Gale, Martha, Ginny, Pat B., Susan, and Pat A. A wide range of fabrics--and just look at those smiles! Thanks, Ladies; it was a great day! P.S. I just finished reading Let Sleeping Dogs Lie by Rita Mae Brown. I am listening to Stolen Prey by John Sandford. P.P.S. Hi Judy and Linda! Great to see you today!